Our mistah that became a Mistah. As the Philippine 2010 elections looms before us, it is important that we reflect on the choices that we will make at the polls. Be always aware that the leaders that will be elected will influence the direction and development of our country. In the incoming elections, there is a candidate that is known to have the interest and welfare of the people in his heart. His name is Attorney Arecio “Edong” Relato Rendor Jr., and he is running for Provincial Board member in the third district of Albay. 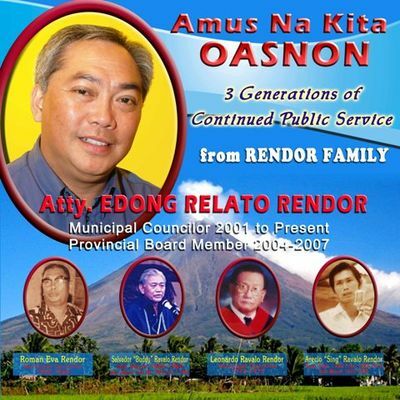 Edong Rendor was born in Ilaor Sur, Oas Albay. He studied in St. Peter’s Academy in Polangui, Albay and later transferred to St. Benedict’s Academy in Guinobatan, Albay where he graduated with honors. He continued his studies in Ateneo De Naga high school and was awarded a first honorable mention for academic excellence when he graduated in 1980. Mr. Rendor moved to Manila and enrolled in De La Salle University where he majored in two courses which are AB History and Political science. Because of his personal drive to excel academically, his name was consistently included in the university's deans list. Mr. Rendor became part of the accelerated class of his course because he surpassed the expectations of his professors . He graduated in 1983 and was awarded second honor for academic excellence. He pursued a course in Law in the University of Santo Tomas and graduated in 1987. He was admitted to the Philippine BAR in 1989. *Acted as Liaison Officer to fastrack the passage of the AFP-DND-PNP Legislative Agenda of then Secretary of National Defense, later President of the Republic of the Philippines, Fidel V. Ramos. Attorney Edong Rendor became a municipal councilor for Oas, Albay in 2001 and has held the position to the present day. He has also been a partner in law firm of Quiason Makalintal Barot Torres Ibarra & Sison law office in Manila since 2001. From 2004 to 2007, Attorney Rendor became the Ex-Oficio member for the Sangguniang Panlalawigan ng Albay. He was the provincial Federation President of the Philippine Councilors League. From June 2007 through March 2008, Attorney Rendor was the Interim National President of the Philippine Councilor’s League (PCL). He also became the Interim Secretary General for the Union of Local Authorities Of the Philippines from October 2007 through March 2008. 2. Authored the plan for the Provincial Ordinance Against Trafficking of Women and children in the province of Albay. 3. Conducted Medical Missions in the various barangays of Oas, Albay with medicines donated by Senator Juan Flavier and the Philippine Charity Sweepstakes Office through the help of Senator Loren Legarda. 4. Distributed books to the different elementary and high schools in the same municipality, with said books being donated by the city of Makati. All these were at no expense on the part of the Municipality of Oas. Attorney Edong Rendor’s extensive experience in serving the people of Albay places him as the people’s choice in serving as a Provincial Board member of the third district of Albay. On the polls on May 10, 2010, please vote for Attorney “Edong” Rendor for Provincial Board Member of the 3rd district of Albay because a vote for Edong is a vote for progress and change. So, did Mr. Rendor win? Hopefully he did.